Defeat the draugr in Soljund's Sinkhole. Talk to Perth about the draugr infestation. Clear Soljund's Sinkhole of draugr. Outside the mine, Perth will stop you and say that the mine is closed until the jarl sends a group to clear out the draugr that infest it, but has given up hope of that ever happening. To complete the quest, enter the sinkhole and clear out the draugr. Upon entering the mine, you'll come to a junction. The left branch leads to a dead end area with three draugr and two moonstone ore veins. Up a ramp is the Light Armor skill book Jornibret's Last Dance, as well as some loose moonstone ore on a table. Heading back to the junction and down the right-hand passage takes you to a large, unclimbable sinkhole. There is one moonstone vein located directly before the sinkhole as well. When dropping down the sinkhole, prepare for a tough fight, as three leveled draugr will converge on you upon reaching the bottom. A few magicka potions can be found along the passage leading to the next chamber, whose exit is blocked by a gate, and which contains three levers and another leveled draugr. Pull the left and right levers to open the gate and head up the spiral ramp; pulling the center lever will trigger a dart trap. The next chamber is accessed through a set of doors; a pressure plate right before them triggers a spear trap. Three leveled draugr inhabit this next chamber, the left side of which is floored with wooden planks covering a small pool containing an unlocked chest. Other loot in this room includes alchemical ingredients, some leveled armor, and two blocks of refined moonstone in a bookcase. The passage behind the doors ascends a flight of stairs, then winds deeper into the dungeon. A small, dark passage at the top of the stairs leads to a small room containing a leveled chest. A pressure plate just past the doors has no apparent effect. 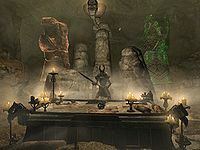 The final chamber consists of a moderately-sized open room, with a stone bier flanked by two statues, and houses a boss-level draugr. The right-hand statue will periodically glow with a green hue, which will heal the boss draugr, while the left-hand statue will periodically glow red, then shoot a fireball at you. This behavior ceases upon the boss draugr's destruction. To the left of the bier is an opening leading to a balcony, which contains a small passage leading back to the sinkhole chamber. Treasure in this room includes some ingredients on the bier and a boss chest behind it. On the way out, there are some ingredients and a leveled weapon resting on a pedestal, as well as two moonstone veins, one to the right of the table and one on the opposite side of the room. Return to Perth for a cash reward and his gratitude. He will also buy any moonstone ore you have acquired, should you wish to sell it. The boss level draugr in the final chamber can be quite a challenge, owing to his ability to heal himself and use magic to disarm any weapon that you may wield. However, he will not leave the chamber, which you can use to your advantage. While still in the access tunnel leading to the chamber, it's possible to sneak to the end of the tunnel and use a ranged attack to hit him in the back before he even knows you're there. Once he does turn around and head towards you, retreat back down the tunnel to a safe distance, firing at him the whole time. A useful tactic is to lure him toward you (while in the safety of the tunnel) and use a full Unrelenting Force shout to knock him down, then pummel him with arrows. At higher levels, the boss may be a dragon priest. It is possible to enter the ruins through the passage which is used to leave the boss' chamber, not having to jump down the sinkhole. In order to do so, you have to climb the rocks surrounding the sinkhole and use Whirlwind Sprint to reach the rock shelf, opening your way to the chamber where boss awaits. This leads to a possibility of defeating the boss without getting past the other enemies. If you do so, the quest will end and you'll receive a journal entry telling that the mine is clear, even though you didn't even see the rest of the draugr residing there. If you want to crawl through the whole dungeon, though, you have to use the sinkhole, as you would be unable to open the lever gate from the other side. The spear trap in front of the door at the top of the spiral ramp seems to be missing its graphic. Stepping on the pressure plate opens the door to the next chamber, the spear trap sound is heard (activating and resetting), you are damaged, but no visual spears are seen extending from the holes in the walls. ? On the PC, it is possible to use the console to advance through the quest by entering setstage FreeformSoljundsSinkholeA stage, where stage is the number of the stage you wish to complete. It is not possible to un-complete (i.e. go back) quest stages, but it is possible to clear all stages of the quest using resetquest FreeformSoljundsSinkholeA.